A new survey of 8,000 patients revealed interesting insights for pharma marketers. According to the Accenture survey, 25% of patients report having either very limited or no knowledge of new products that might be suitable for them. Less than half of patients believe their doctors discuss the full range of product options with them, and only 44% feel they have significant input in their treatment selection even though nearly two-thirds (63%) want to be involved in such decisions. The conclusion: patients are seeking more info and control over their treatment, but how should pharma marketers deliver this to them? The survey also indicates direct to consumer/patient (DTC) might not be the most effective method of delivery. Why? Despite survey results showing that many patients look online for information about new treatments, this method doesn’t sway decisions in the same way relationships with HCPs do. 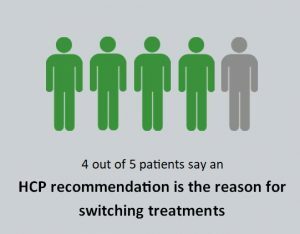 Over 80% of patients who switch treatments say the primary reason is a recommendation from their HCP (the reason patients cited most often). HCPs remain the primary influencer of patient treatment choices despite the availability of data online and bombardment of DTC ads on TV. Other avenues may help in raising awareness, but when it’s time to make decisions, patients still seek personalized information and are influenced mainly by their own HCPs. However, further evidence suggests that it’s not busy physicians at whom you should increase your marketing and educational efforts. HCPs were asked about barriers in timely and effective treatment in a survey last month by RNsights, and 33% indicated an obstacle of “understanding patient concerns and finding the time to listen to them during office visits.” Physicians are the HCPs most pressed for time, so the key to personalized delivery of data and recommendations to patients is another type of HCP with just as much or more patient influence. In fact, for the 15th consecutive year nurses have ranked as the most trusted professionals in the country by the American public, ahead of physicians and pharmacists, in a Gallup poll about honesty and ethics. Some patients feel less rushed in interactions with nurses, NPs and PAs compared with their interactions with physicians, and some patients just feel more comfortable asking questions to nurses, NPs and PAs known for their high patient satisfaction ratings and role as patient advocates. Leukemia PA manager Mary-Alma Welch points out how PAs, NPs and nurses are an integral part of the healthcare team not only for the quality of care but also because they fill needs that no one else can. For example, she says “we answer questions that patients are too shy… to ask their doctors.” NPs and PAs are high level providers who can prescribe and are often seen in lieu of a physician. Nurses, NPs and PAs can significantly influence patient outcomes and treatment choices; they are less rushed and, therefore, more approachable than most physicians while delivering the medical knowledge and personalized recommendations patients seek. Are you targeting these key HCPs in your marketing efforts? Please subscribe to automatically receive a notice so that you don’t forget to read the next topic.